10 things I learned while making my 2 year old lunch today. 1. I LOVE bread, too much, but somehow peanut butter tastes so much better by the finger full than it does on bread. 2. Peanut butter tastes even better on chocolate. 3. We are almost out of Jelly... again! 4. I have GOT to stop buying MY favorite kind of chips for my kid's lunch. 5. I am not near as tempted by apple slices as I am chips. 6. While buying the jumbo jar of peanut butter is more economical and lasts longer there is not a butter knife on this planet that is long enough to scrape the bottom of that jumbo jar. 7. If you sit down on the couch to have a phone conversation in the middle of making your 2 year old lunch she will not appreciate it. 8. Talking on the phone while clanging around in the kitchen will only fool a 2 year old for so long. 9. Taking away your 2 year olds plate after putting it in front of her so you can take a picture of it for your blog post... also not appreciated! 10. Seriously, how are we going through the jelly this fast?! First of all let me take a moment to brag! I had the awesome privilege of being raised by two godly parents. I grew up watching them seek God daily, they prayed for us and with us. They taught us from the scriptures. And they continue to be a huge source of encouragement to me now. I am lucky, I am blessed. I wrote months ago about some problems I was having with my health. (Click Here) Unfortunately things have not gotten better, in fact they seem to be worsening. Two weeks ago the reumatologist shared a blood test result that was not encouraging and now we wait to see how accurate it was. My parents (who leave me in the dust in their ability to write) have been very faithful to pray for me, reassure me and help out where they can in the midst of all of this and today I received an email from each of them with some very uplifting words. I would like to share both of these messages with you. They were meant for me but I believe there is some truth there for all of us. 4. "faith" of course is the key. You can't give up that this is inevitable. God promised a future and a hope. God says, "I know the plans I have for you ... plans for welfare"
I was just doing a word study last night on the word "welfare" which is the Hebrew word shalom. That word is so full of meaning that it is difficult to translate. Therefore there are over 80 different words used to translate it. Some of which are peace, safety, assurance, blessing, whole, favor, ease, good, health, harmony, prosperity, rest, secure, soundness, success, strength, triumph, victorious, well-being, yes, etc. There is not one negative word used to translate shalom. I came up with a definition for it a few years ago. I said, "shalom means 'all good things'". That's what God's plan is for you. Don't let anyone convince you otherwise. Wow, there is so much here, I keep going back and rereading it. I am a very dependent person. My parents taught us responsibility very early on. But as far as my security and my beliefs in what the scriptures have to say, I had wise role models, so I often looked to them for “my own thoughts”. Then I was extremely fortunate to marry a godly man who also had great knowledge and confidence in the Word of God. Therefor it was just as easy to depend on him to lead me. In the past few years I have recognized my need to figure out where I stand and what I believe on my own. There is still so much for me to learn and because of my former reliance on others for spiritual understanding accepting this word for myself is very exciting! Notice the truth my daddy brings home in the next two thoughts. We, and we alone have to receive the gifts God has for our lives! My dad always explained it like this. 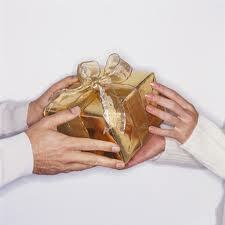 He can offer me a present but until I take it from him I do not have the present in my possession. Receive all that he has for you but be mindful of who enables you to even take a breath. Do not believe for one second that you have these blessings by your own doing! The last thing I want to say is this, I believe fully that God can and does use all things to strengthen us, bring about maturity in our lives, and bring Himself glory. But I also believe He has the power to heal and that He still works miracles! What His plan is in all of this, I do not know. But I have plenty to rest in! I know God will be faithful to show me His intention and good works during this season of my life and as He does I will likely share it right here. I was thinking about you this morning and remembering the verse that God gave daddy. We were talking about it the other day and he quoted it, differently than I have always said it. When I heard it from the NKJV, that he was using it had even more meaning to me. I wanted to share it with you. I am going to dwell on this verse today, maybe you can too. There were some key things for me in this verse that I had not seen before. "herself" she received it herself no on else could receive it for her. It was between her and God. Then I had always thought it said "God gave Sarah strength" I like "received" much better. It still implies that it came to her "given" but then she "received" it. That requires action. We acted on that verse when you were little on your behalf. Now you are all grown up (sniff, sniff) and can act on it yourself. I got excited as I thought about this verse this morning. I am not denying the test or the meaning of it. BUT I was inspired that even in the midst of all of this the idea of you receiving strength. To cope with where you are at this moment in time, to stand on the words God gives to you and Jarrod etc. Anyway it filled my heart so I wanted to share with you. I love you Sarah. I didn't give up 32 years ago nor will I today. If this disease is something God has for you to walk in then I believe He will once again allow you to receive strength to walk this path in victory and grace. You are my Roo after all. Again, it is such a great word! And how blessed I am for parents who love and pray for me - who are bold enough to go before the throne of God and remind Him of His promises. I am taking that same confidence with me in prayer today. My parents can stay encouraged, believe the best and pray for me. But they cannot receive nor can they use this strength that God has given me. As my mom said it was between Sarah and God back in Genesis and it is between me and my heavenly father now! How foolish I would be to not act on this. Thank you to my parents for their words of wisdom. And thank you Lord for your strength that can be renewed, that is sufficient, and in which I can do all things!